Everything in this page was made for a specific set or scene in chapters 2 and 3, but ended up hidden or barely noticeable. "Tri-Ver Forerunners" is just a completely random cooperation name, with an equally random logo created by mashing the keyboard using a random font. "Modern Fighter Craft" is a magazine in Commodore Pearson's waiting room, which mentions how unsatisfied I am with the final appearance of the Zweihander, as compared to the sleeker Sabre. "Extra Terrestrial Cartography" features a small section of the map I made for a fantasy novel which I may never finish at this rate. 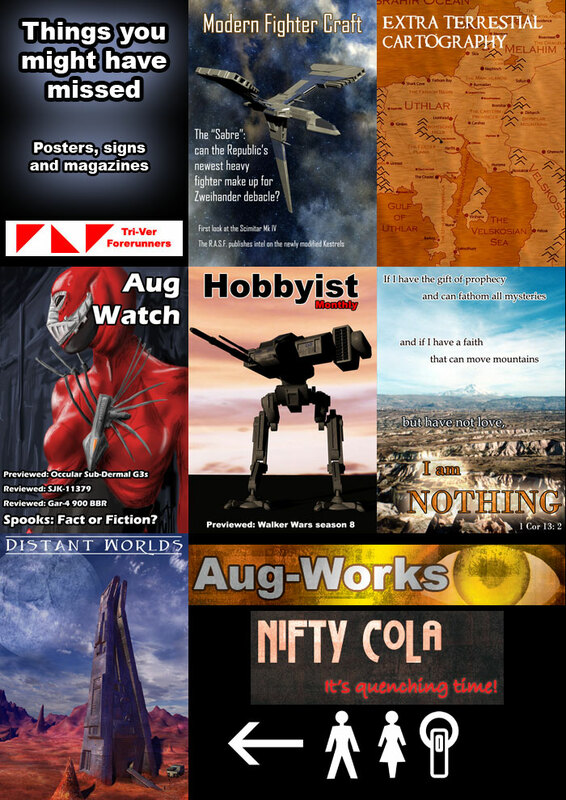 "Aug Watch" features a spook, a series of photoshop paintings I did some years ago. Hobbyist features a mech which I built three or four years ago, and which I'm not particularly proud of. "I am Nothing" is a quote from the Bible on top of a photo I took when I visited my Mum in Turkey. Distant Worlds features some art I put together a few months before I started work on Crimson Dark. The other images are signs from the Esplanade, including the "Male Toilets, Female Toilets, Aug-recharge stations" sign which prompted much speculation. Next update will be the title page for Chapter 4, yay! I'm excited.